Beautifully situated on the western coast of India, Maharashtra is one of the most vibrant states of India. This state exhibits a diverse yet amazing blend of culture, heritage and architecture. Right from Bollywood to colorful festivals and temples, high mountains (containing enthralling caves) to beautiful beaches and forts to blessed temples, Maharashtra has almost everything to entice an eager traveler. With beaches, ancient archaeological sites, colorful festivals and temples, culture and cities, this state is counted amongst the most prominent tourist destinations in India. On this page, we have listed many of Maharashtra holiday packages for you to choose from. In fact, booking a Maharashtra vacation from goaroundtours.com is a good idea. 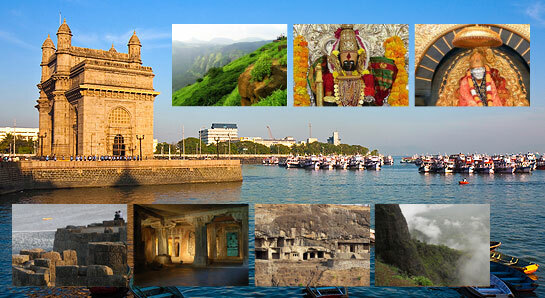 So, don't wait anymore and select any of the Maharashtra tour package for a memorable holiday! goaroundtours.com brings this 2 nights and 3 days tour package for travelers who love to explore the religious side (Shirdi) and historic Ajanta & Ellora Caves in Aurangabad. Get ready to enjoy a fun weekend with this 2 nights and 3 days holiday package covering the two popular hill resorts of Maharashtra, Lonavala and Khandala. Take your beloved for a memorable and romantic weekend tour in Lavasa, a beautiful city located in Pune. Book this tour now and surprise your lover! This 2 nights and 3 days tour package gives you an opportunity to have a fun weekend in Alibaug, a classy hill station in Maharashtra. Get ready to have a fun filled holiday with this 4 nights and 5 days tour package which covers popular hill stations of Maharashtra including Matheran, Lonavala and Khandala. goaroundtours.com presents this special tour of Maharashtra that covers visits to popular places of the state including Mahabaleshwar, Panchgani, and Pratapgadh.